Yardmax, a manufacturer of outdoor power equipment, released a new power sweeper, which features a nylon brush, Briggs & Stratton engine, ergonomic design and adjustable handlebars. The Yardmax Power Sweeper is built to clean and clear surfaces in year-round conditions, including snow accumulation up to 6 inches. The Briggs & Stratton engine offers 9.5 foot-pound torque, providing enough power to handle snow, dirt, sand, gravel and other debris on various surfaces, the company said. It has a sweeping width of 28 inches and a brush diameter of 14 inches. 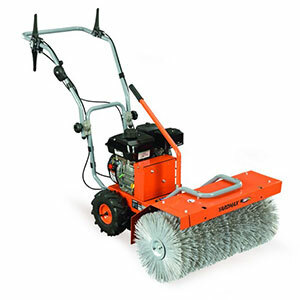 Additional highlights include adjustable nylon brushes with three sweeping directions, a handlebar design with adjustable heights, forward and reverse speeds, and an optional dust collection bucket. Yardmax offers a two-year residential warranty on all equipment and a 90-day commercial warranty.